Consider this: Gartner Research estimates that by the end of 2017 (that’s NEXT year!) marketing will be responsible for purchasing and managing more technology than the IT department. 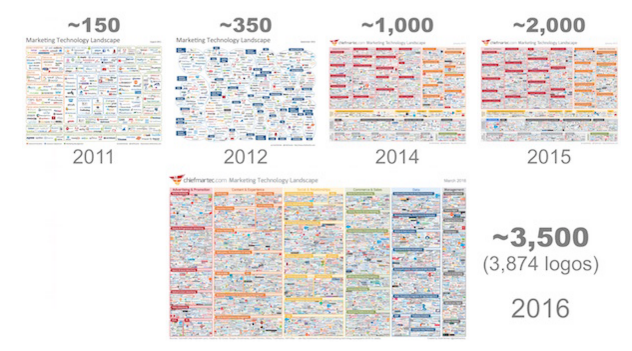 Take a look at these charts, compiled by Chiefmartech.com (and this doesn’t even account for sales technology options). Here’s the bottom line, your use of technology will never be the reason you succeed, but it very well can be the reason you fail! If you don’t have a strategy/roadmap to guide your technology decisions, you’d better start to create one; and if you have one, be sure that it’s every bit as strong as your marketing and sales strategy. Clayton Christensen, author of The Innovator’s Dilemma, originated the idea that when you buy something you’re actually hiring it to achieve a specific result or set of results. For example, you’re not buying a Snickers bar as much as you’re hiring it to eliminate the feeling of hunger. You’ll judge your satisfaction based on how well it does the job. When you view purchasing decisions through a hiring lens, it totally changes your perspective. Using the Snickers bar example again, if you realize the outcome you want is “eliminate the feeling of hunger” you will immediately think differently about what you’re doing. You may consider whether you’re looking for a short-term fix or a longer-term one? Healthy or not? And that can lead to a totally different decision. When considering technology, you want to be sure the consideration starts from a clear understanding of the business outcomes you are seeking. This can be hard, as tech companies do a phenomenal job of making their solution sound amazing. It’s easy to fall into the trap of loving a solution presented to you so much that you begin searching for problems it can solve and then convincing yourself that you must have it. Don’t make this mistake. Trish Bertuzzi asks a great question around technology. Are you buying a toy or a tool? Far too often companies end up buying toys (often caused by violating the 2nd rule above). 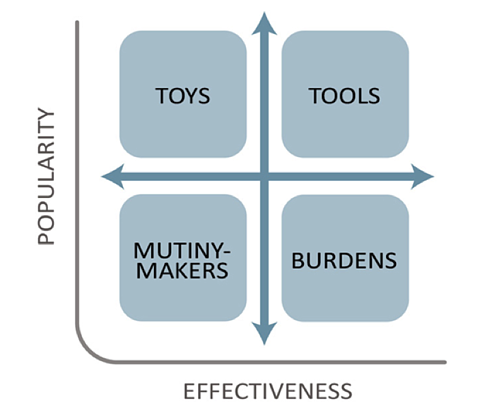 As Trish’s chart above highlights, when you deploy technology because “everyone is using it,” or because your friend who is a VP at a company like yours says that it’s “absolutely killer, I don’t know how you’re doing business without it;” you are buying a toy. You’re buying a tool when it drives a specific, important business result that was identified before the technology was considered. As my team will attest to, this is the mistake that I love to make. You’ve followed the first three rules and clearly understand the problems and results you’re seeking. Then you find four apps that are everything you wish for and they’re “only $15/user per month.” Holy cow! How can you not buy them all and roll them out. If only life were so easy. 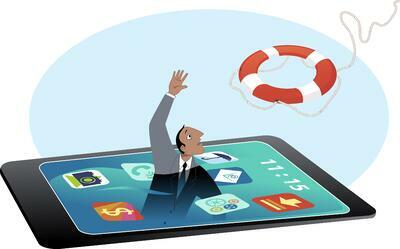 Even the simplest apps are disruptive. They require people to change how they do things. Changing too much too soon is a clear recipe for failure. You end up worse than you started, and with cynical people to boot. Before you jump on the next killer SaaS product, be sure you’re clear about what technology you’re using and how you’re using it. When we work with companies to help them build out their strategy and roadmap, the first thing we do after we’re clear on their desired business outcomes is an audit of the existing sales and marketing stack. What tools are they currently using? How does they all work together? What opportunities are they missing? What tools have become toys or burdens? When you do this, you not only ensure that you’re leveraging your current capabilities, you’re also able to determine how new tools impact your existing tools. It’s a good idea to review your existing technology stack every 3 - 6 months. Use Trish’s chart above to assess the tools. Just as every employee has to continue to demonstrate that they are creating value, so too does everything in your sales and marketing stack. 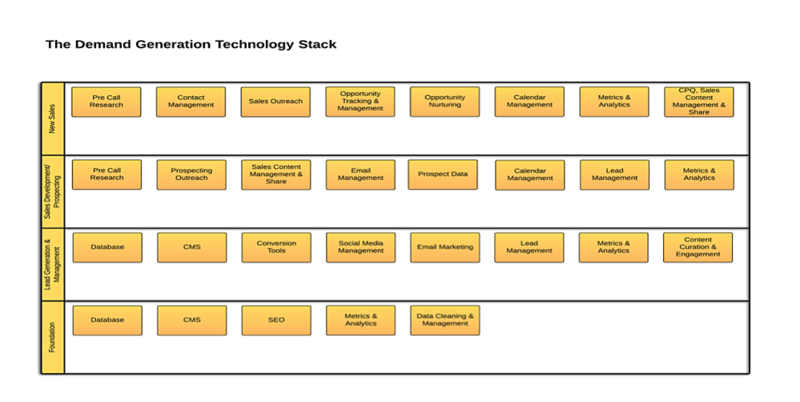 We’ve created the following chart to help you build your technology roadmap. As the rules above state, the chart ensures your focus on business outcomes and the capabilities you need to win. We align the roadmap with your demand generation process and identify the typical capabilities that are needed within each phase. Keep in mind that you don’t need to fill every box in this chart with technology. What you need to do is identify where the gaps are in your process and the capabilities you need to address those gaps. Only when that is clear should you begin to look for potential technology solutions. By putting outcomes before solutions, managing decisions around the acquisition and utilization of technology becomes a much simpler process. By building a roadmap, you’ll be in a strong position to be sure that your technology investments are supporting and driving business results. Further, when you outgrow or outlive their relevance that becomes clear. With this approach, technology becomes less disruptive and your demand generation process becomes far more efficient.